Google is incorporating several new features into its Maps app on Android-powered devices—which are also coming soon to iOS—to make it easier to search and navigate using the service. The updates, which were announced Wednesday by the company, also include for the first time a dedicated Maps design for Android tablets. The updated app is gradually rolling out globally in the Google Play Store, Google Maps director Daniel Graf said in a blog post, and will be available “soon” in Apple’s App Store, which incidentally turned 5 years old Wednesday. Additionally, two longstanding Maps features serving a more social purpose—Google Latitude and check-ins—are being killed off as part of the update, and instead are transitioning over to the Google+ social network. All told, the changes constitute “a new mapping experience that makes exploring the world and getting to the places that matter to you a lot faster and easier,” Graf said. For instance, the update lets users browse places without typing by displaying a series of cards after tapping on the app’s search box. Covering categories like “eat,” “drink,” “shop,” “play” or “sleep,” the cards reveal nearby places and businesses that now also incorporate a five-star rating system to show how people’s friends and others have rated those places. Google aims to improve the app’s navigation features by incorporating reports of problems on the road that users can tap to see incident details. While on the road, the app will alert users if a better route becomes available and reroute people to their destination faster, Graf said. Those sorts of tools mirror the functionality of social mapping app Waze, which Google bought last month for as much as US$1.3 billion, reports said. 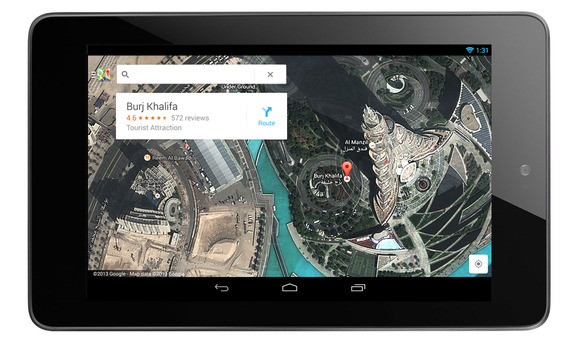 The deal was geared toward adding more real-time navigation tools to Google’s own Maps software. Waze’s technology, however, was not incorporated into Maps’ new incident reporting features, a Google spokeswoman said. Google currently gets that type of information from other data providers such as TomTom, she said. The company declined to specify a timeline for when Waze’s technology might be incorporated into future Google products. Google has already provided GPS-based navigation tools on Android devices, which give voice guidance and turn-by-turn commands to help get people to their destination. Finally, all of Maps’ new features are being brought to a new dedicated app for Android tablets, which will be coming soon to the iPad, Google said. Meanwhile, Google Latitude and check-ins are no longer supported by Google Maps, but location-sharing and check-in features have been added to Google+ for Android, the company said. Those tools will be retired too from older versions of Maps on Aug. 9. Google launched Latitude in 2009 as a way for people to see the approximate locations of friends and others who have shared that information. With the retiring of Latitude, users’ lists of friends within that service will be deleted, users won’t be able to see or manage their friends, and any existing friends will no longer see people’s locations in Google Maps for mobile on Android, the company said in its online help center. But while location sharing will no longer be possible with Latitude, users can still take certain actions with their location information, such as by sharing their location with friends on Google+ using the Google+ Android app, Google said. The ability to share your location on Google+ on iOS, the company said, will be coming soon. Google has added a slew of new features to its Google+ social network in recent months as the company strives to make it a stronger competitor to Facebook and Twitter. More than 40 new features were rolled out in May, such as a redesigned social stream, automatic hashtagging and photo-sharing enhancements. During the company’s annual I/O developers conference, Senior Vice President Vic Gundotra reported that “hundreds of millions” of people had joined the service, but the actual number of active users was not specified. Facebook has more than 1 billion monthly active users. Google is also ditching the offline maps feature for Android, and instead has created a way for people to access maps offline by entering “OK Maps” into the search box when viewing the desired area for later, the company said.